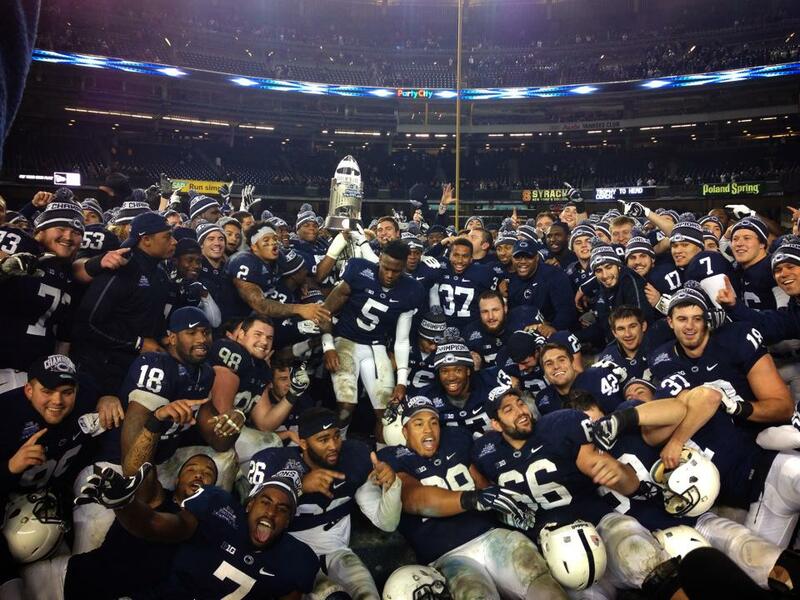 Penn State ends the 2014 campaign with a 31-30 overtime win against Boston College in the New Era Pinstripe Bowl. This is more than just a victory on the field, but also off the field. For all of the naysayers who dismissed Penn State in the wake of the Sandusky scandal, the Nittany Lions proved that with the right coaches, teammates and chemistry, winning is possible. Under coach Bill O’Brien, Penn State overcame heavy sanctions managing an 8-4 (2012) and 7-5 (2013) record, which would have been good enough for post-season play. When O’Brien left for the NFL, Coach Franklin continued the winning tradition leading the Nittany Lions to a 7-6 record and bowl victory in 2014. With all the sanctions lifted this past September, the team got an early start to normalcy. The Pinstripe Bowl victory was just an added bonuses. Only a few programs could have weathered the storm such as Penn State. After two new football coaches, the settling of virtually all the victim lawsuits, a Sandusky guilty verdict, Penn State can finally close this chapter on its darkest days and move into 2015 with new hope and promise.